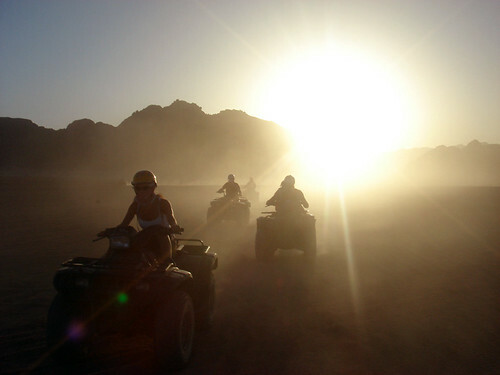 Quad biking in the Sinai desert, originally uploaded by Craig Grobler. The Sinai Peninsula or Sinai (Coptic: sina; Egyptian Arabic: sina سينا; Arabic, sina'a سيناء; Sinin in most Semitic languages, Hebrew: סיני‎ Sinai) is a triangular peninsula in Egypt. It lies between the Mediterranean Sea to the north and the Red Sea to the south, forming a land bridge from Africa to Southwest Asia. Its area is about 60,000 km². The Egyptians call it the Land of Fayrouz.